Warners Bay Dental have state of the art facilities to perform Crowns and Bridges. A dental crown covers a tooth, usually the entire tooth. This enables dental crowns to improve the appearance and increase strength. As a dental crown is made outside the mouth, it can be made out of different types of material i.e. ceramic (porcelain), metals or a combination of metal and porcelain. Ceramic (Porcelain) – Ceramic dental crowns achieve the best possible aesthetics. They are as close as possible to natural looking teeth. We at Warners Bay Dental, with the use of the Cerec (digital) machine are able to offer ceramic (porcelain) restorations in one appointment or the conventional two appointment method to restore with a dental crown. Porcelain Fixed to Metal – These dental crowns have a metal core and a porcelain covering and share some of the principles of porcelain and some of the principles of metal crowns. Porcelain fused to metal crowns are used when certain properties of the different types are required. However, in certain situations the underlying metal can show through the, with usually a dark line at the gum line. Metals – Metal crowns are normally used for back teeth where the dental crown is not visible. Metal crowns are made from gold alloy or base-metal alloy (e.g. Nickel or Chromium). In most cases dental crowns are used to replace large areas of missing teeth. Due to this, in a small number of cases the pulp (nerve of the tooth) can be in close proximity which may result in requiring further treatment i.e. Root Canal Therapy. What is Involved with a Dental Crown? Step 1. Tooth Assessment – Our dentists at Warners Bay Dental will assess the tooth clinically and possibly with an x-ray. The dentist will then discuss options and cost of possible treatment. Step 2. 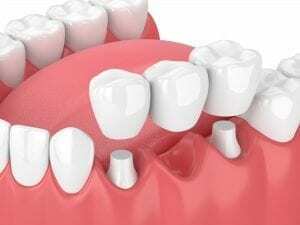 Tooth Preparation – The tooth will need to be prepared by removing decay, part or all of the existing restoration and also shaping the tooth to help with the seating and stability of the dental crown. Step 5. The same day the permanent tooth will be bonded. Colour of your natural teeth. The dental crown will usually be matched in order to look the same as your adjacent teeth. So it is a good time to consider the shape and colour of surrounding teeth. Restoring or bleaching is possible to improve your smile. The cost will vary between the different types of crown. Your dentist at Warners Bay Dental will be happy to create an estimate of cost. If you call your private health fund insurer regarding your eligible rebate, the item number to quote will be either: 613, 615 or 616. Bridges replace one or more missing teeth. They consist of an artificial tooth bonded to a patient’s natural teeth on either side of the gap. What material is a bridge made of? Bridges are generally made of porcelain. Porcelain is strong and can be made to match the colour of the natural teeth, whilst being resistant to staining. Why might my dentist recommend a bridge? Can my dentist fabricate and fit a dental bridge? All general dentists are qualified to fit bridges however; a dentist with specialist training in crown and bridge work is called a prosthodontist. You will require at least two appointments for preparation and fitting of a dental bridge. On your first visit, the dentist will take an impression of the upper and lower teeth using a soft gel-like material pushed onto your teeth and held in place to set for three to five minutes. After the teeth on either side of gap are shaped by drilling under a local anaesthetic, another impression is taken to record the changes to the prepared teeth. The impressions are then sent to a dental laboratory for fabrication. 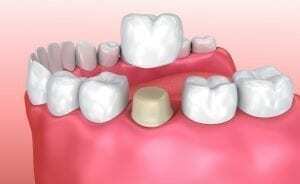 To protect the prepared teeth, temporary crowns are fitted with temporary cement until the next appointment when the temporary crowns are removed and the permanent bridge is fitted. Bridges should last for a number of years however; there is no lifetime guarantee. Longevity of the bridge will depend on good dental hygiene and oral health. Therefore dental check-ups are advisable. Bridges require regular flossing and brushing.